1, Screen frames placed area: can also place screen frames: 8.The screen frame and a length of 65 cm (25 inches) the width of 45 cm (18 inches), each layer of the rack height of 5.5 cm (2 inches); 8 layers,the length and width of the screen can be placed in size (diameter) 65 cm (25 inches) and 42 cm (17 inches)within the various screen; such as screen too small, on each shelf on a layer of wood or cardboard as a plate placing screen. 3, Steel spatulas placed area: the top platform area has 8 4.5 cm long; steel spatulas 0.3 cm wide inserting hole; and placed 8 to various sizes of the Steel Spatulas . 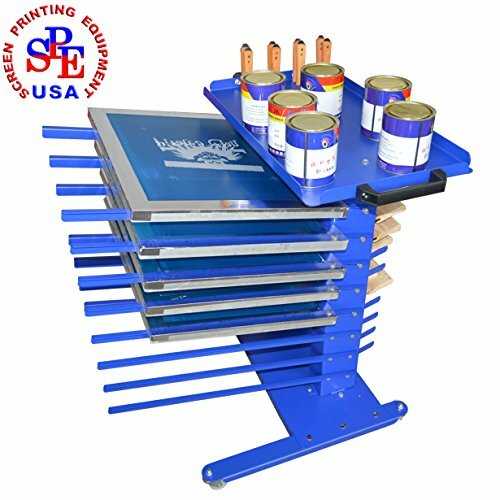 5, Mobile Type Screen Printing Material Rack at the bottom there are four two inch universal with brake casters; can move any direction in the work area. Mobile Type Screen Printing Material Rack Aluminum Frame Rack/Squeegee Rack/Ink Rack/Spatulas Shovel Handle Knife Rack.The table of theTHIS DOES NOT INCLUDE THE squeegees, inks, spatulas and screens. They are only used for illustration.